Set-up with 2 players back to back in the middle at position B. 1 player at position D & E with the rest of the players split between position A & C.
Position A & C must start at the same time and each player must follow their pass. Player A passes to Player at position B and follows his / her run (1). Player B controls the ball and passes to player at position E and follows their run (2). Player E controls the ball and passes back to player at position A. This can be progressed by changing the direction of the initial pass, so from A to E to B back to A. Progression of revious passing drill. This can be progressed further passing between both groups. A passes to B, who passes to E, who passes to C, who passes back to B, Who passes to D, who passes to A. The objective of the drill is for non-bib players to keep possession of the ball. Players with bibs have to gain possession and they can score into any of the 4 goals. Swap the bib players after 5 mins. Progress by allowing the non-bibs to score once they have made 5 or 10 passes. Progress by challenging the bibbed players to gain possession in 5 or 10 seconds. 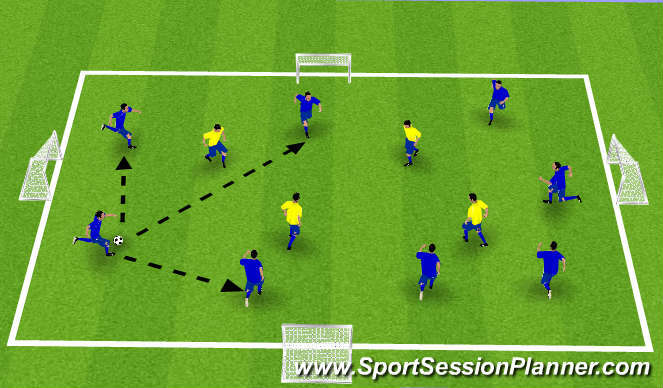 This main focus of this drill is to work on the attackers movement to get away from their marker / defender to receive the ball and make a blind run round the back of the defender to receive a forward pass on the move and finally shooting practice. Striker, Player (B) is posistioned in front of the defender / mannequin. Player (B) makes space by moving to the red cone and receives Pass (1) from player (A). Player (B) controls the ball and passes ball back, Pass (2) to Player (A). 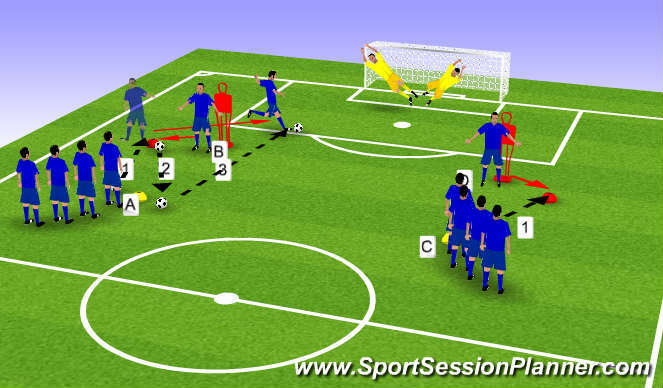 Player (B) then spins and makes a run behind the defender / mannequin. Player (A) passes the ball (Pass 3) for Player (B) to receive on the move and to take a shot at goal with right foot. Player (B) collects his ball and returns to the back of the opposite group. Player (A) takes the position held by Player (B) and waits for Player (D) to collect his ball. Quick movement to get away from defender / mannequin. Correct technique when striking the ball.